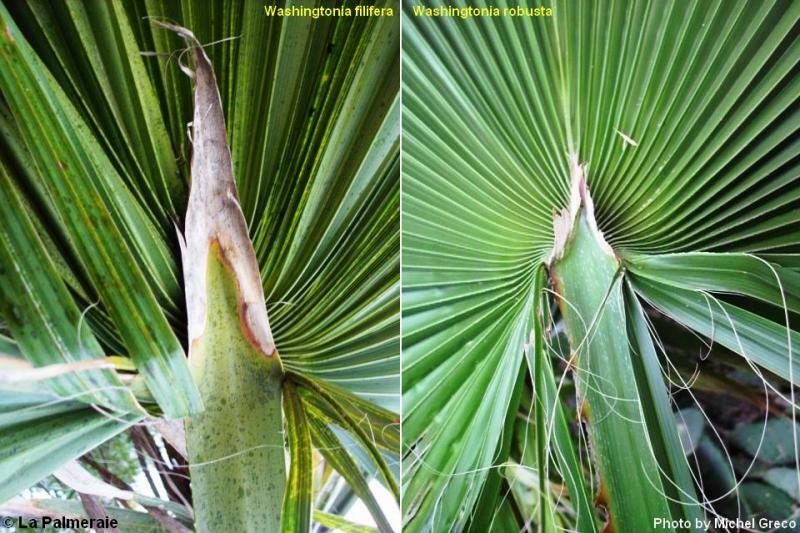 The popular Washingtonia genus counts three species. 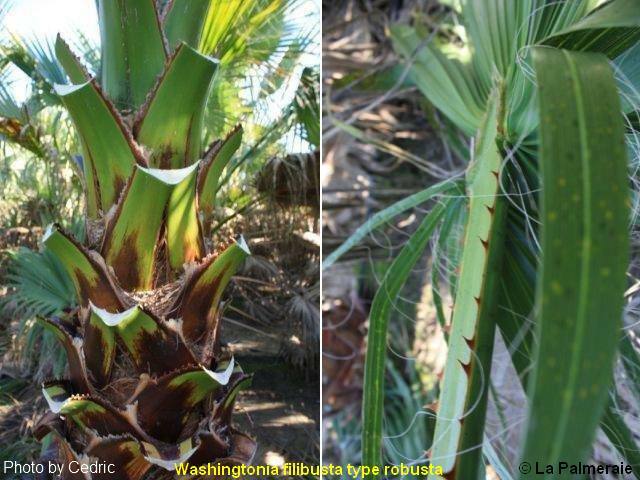 The W. filifera, the W. robusta and the hybrid W. filibusta. These are however very much similar, so only an practiced eye can really determine the species with certainty. In this article you will learn what characteristics you should look for to make the distinction. 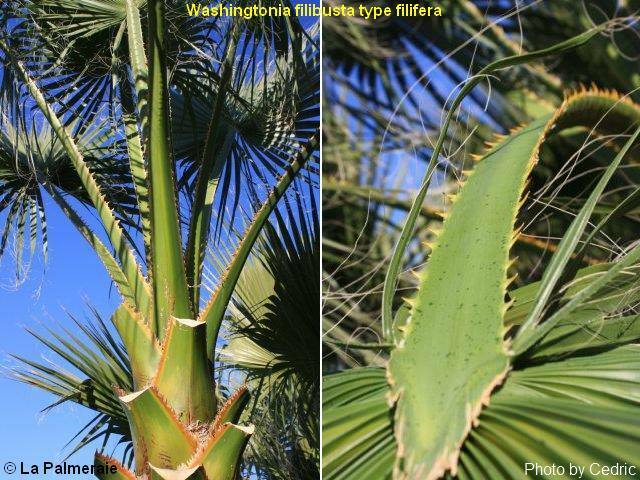 The most common species are the Washigtonia filifera and the Washingtonia robusta. Both are the the most easy to separate from each other if you know what to look for. The filibusta is a bit more complicated, further on more about this species. Nb. Young plants look very similar and are therefor harder to determine. This is why we mainly will show/discuss older subjects. Only slightly colored (reddish-brown), limited to the base. Strongly colored deep purple-brown on widely spread and continuing on the petiole. If the old petioles weren’t cut very short the coloring isn’t always that obvious. Covered with spines but not as many and aggressive and placed more irregularly. They aren’t always colored as much. The last few cm’s/inches of the petiole close to the leaf base lacks spines (or the are negligible). Covered with spines, aggressive, placed regularly and colored. 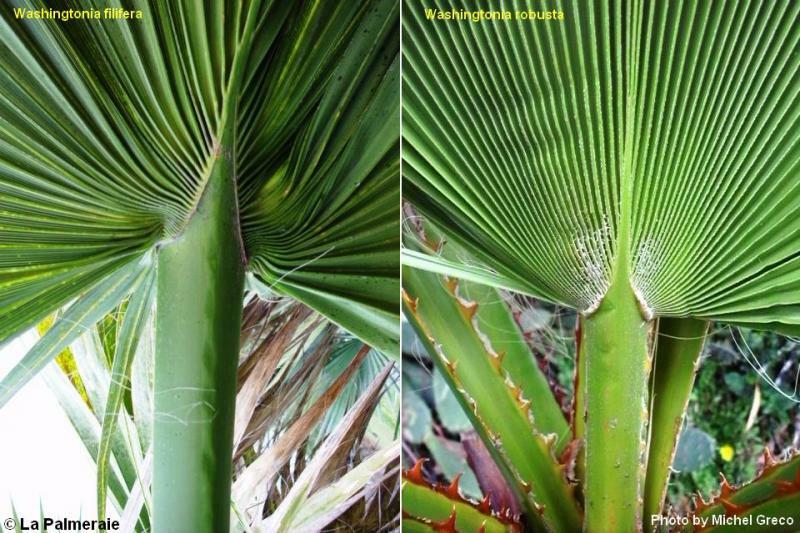 Especially those spines that continues all the way through to the leaf base is a strong characteristic. 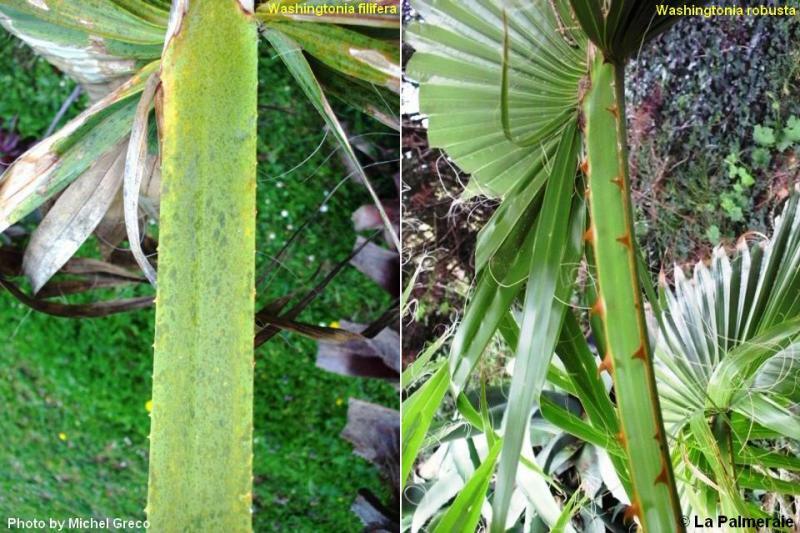 The hastate (the spear like end where the petiole meets the leaf) is relatively long and is not covered with hairs (trichomes) on the sides. 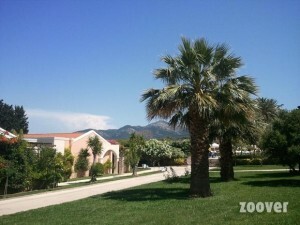 (2nd photo). The hastate is shorter. On the bottom side of the leaf the hastate is also covered with hairs on both sides. (trichomes: see 2nd photo). Off green color, leaf segments are deeply cut out, below the 50% mark. Deeply green, shiny, leaf segments are not cut out any deeper than the 50% mark. Irregularly shaped with a clear thickening at the base. Remains more compact than the robusta. Looks impressive, voluptuous. Will be bigger than the filifera. 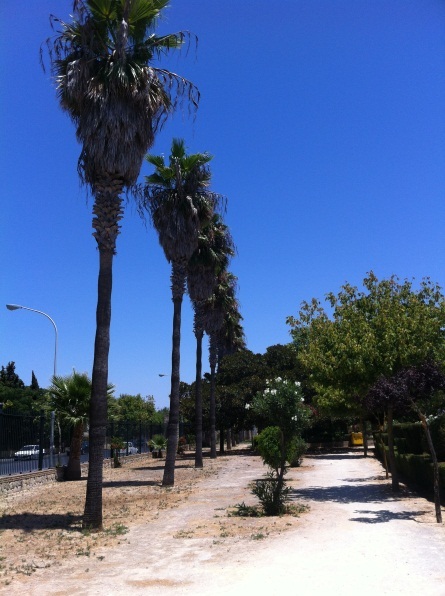 This species is a hybrid, or crossbreed, between the robusta and the filifera. Both species can carry the seed. The mother plant determines the type of hybrid. A filibusta type filifera is derived from a female filifera pollinated by a male robusta and vice versa. A filibusta has the characteristics of both parents even though they are less prominent. 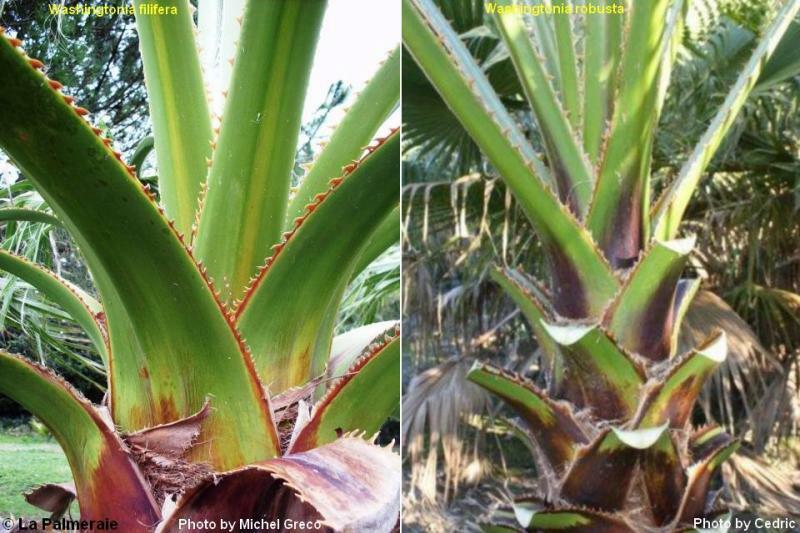 For example, the continuous brown stripe one the petiole may be present but much smaller than a robusta. Or the hastate is only slightly covered with hairs. This makes it difficult to name a filibusta with certainty if you are not sure about the mother plant. Thanks,very usefull. 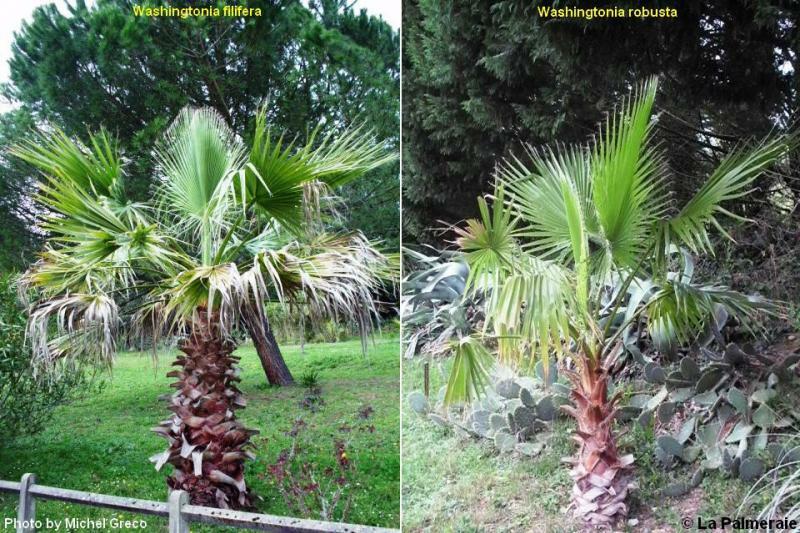 It’s pretty difficult to understand what Washingtonia you’re seeing..
Once you know what to look for it becomes a lot easier. Especially the color of the leaves that are a lot less bright and shiny on the filifera (more grayish) in combination with the leaflets that are way deeper cut out.